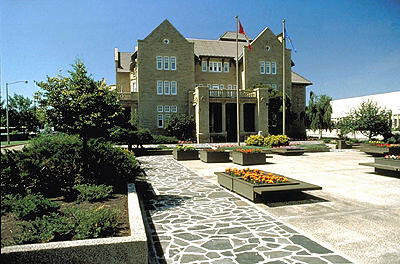 Alberta's Government House is located in Edmonton and was the official residence of the province's first six lieutenant governors. The house is now used for conferences, award ceremonies, receptions and special events hosted by the Lieutenant Governor, the Alberta government and various public sector organizations. Construction on the building began in 1912 and it was officially opened October 7, 1913. The house was designed in the Jacobean Revival style which is characterized by bay windows, high gabled roofs with raised ends, and groups of rectangular windows. The architect was R.P. Blakey. The provincial government closed the house in 1938. It remained vacant until in 1942, when it was leased to North West Airlines which had contracts for the delivery of aircraft to the United States government to support the construction of the Alaska Highway. From 1944 to 1950, it was used as a convalescent home for wounded veterans. In 1951, the house was purchased by the federal government to serve as a home for disabled veterans. In 1964, Government House was returned to the Province of Alberta and, in the late 1960's, restoration work began. The restored building reopened on August 1, 1976 as a government conference centre. The house now consists of a large combination reception and dining area on the main floor, as well as a music room and a library. The main floor was restored to resemble that of the original building as closely as possible. The second floor consists of a central reception area surrounded by six small conference rooms, each named after one of the six Lieutenant Governors who lived in Government House, and a small study. The third floor consists of a large conference facility named the Alberta Room.